Here at North Shore Commercial Door, we've got everything you need to replace or replace parts for your Sears Craftsman garage door opener. Whether you've run into electrical problems signifying the need to replace a circuit board or have found that your remote has stopped working properly, North Shore can help you find the right replacement parts to get your system back to new. Shop low-priced Craftsman garage door opener parts from our store and enjoy low prices, free shipping and complimentary technical assistance. We have a full line of Sears Craftsman remote controls that are compatible with Liftmaster garage door openers as well. 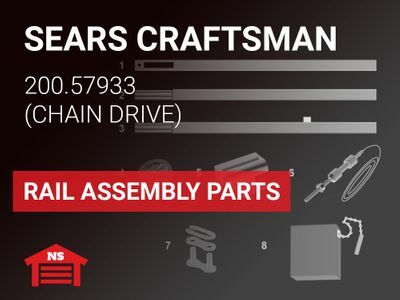 To determine whether your LiftMaster system will work with a certain Sears Craftsman remote, find the model number on your LiftMaster remote control and cross-reference it on our chart of compatible Sears models and Sears Craftsman garage door opener parts list available below. In many cases, the Sears-compatible LiftMaster remote controls are more affordable than Sears model remotes. Additionally, many Sears Craftsman garage door opener circuit boards are also compatible with LiftMaster openers. In addition to Sears Craftsman remote controls and circuit boards, you'll find a large range of Craftsman garage door opener parts at North Shore. We supply Sears Craftsman AssureLink garage door opener accessories, which allow you to program, monitor and operate your garage door with an easy-to-use smartphone app. These components are all designed to help you keep your LiftMaster and Craftsman garage door openers up and running for the long-term without the cost and hassle associated with a complete system replacement. Check out our Craftsman FAQ Guide or Contact us today by phone at 800-783-6112, by e-mail or via our convenient live chat system for more information.